Setting up Linksys routers with a Cable Internet Service can be done either by inserting the installation CD or manually configuring your router’s settings. For Linksys Wi-Fi Routers and Linksys Smart Wi-Fi Routers, it is recommended to use the Linksys Connect Software. To know the steps on how to set up a Linksys Smart Wi-Fi Router using Smart Setup, click here. QUICK TIP: If you are unsure about the type of Internet connection you have, contact your Internet Service Provider (ISP). QUICK TIP: To reconfigure a previously used router, reset the router to factory defaults. To do this, press and hold the Reset button of your router for 10 seconds. The Reset button is usually located at the back of the router. Connect the computer to the Cable modem using an Ethernet cable. If your computer is getting Internet connection, you may proceed to the next step. Otherwise, contact your ISP. NOTE: Some Cable modems have their USB ports configured by the ISP to give your computer the Internet connection. If the physical connection is through a USB port, you will not be able to go online using an Ethernet connection. Contact your ISP to have the Ethernet port of the modem configured. In this example, the Linksys E4200 is used. Connect the Cable modem to the router’s WAN or Internet port. Connect a computer to any of the router's numbered ports (1, 2, 3 or 4). If you are using a wireless computer, you will need to connect it first with an Ethernet cable. NOTE: In this example, a computer is connected to port number 2. Connect the power adapter of your router to the power outlet. After connecting the devices together, check the lights on the front panel of the router. Ensure that the lights corresponding to the ports where the Ethernet cables are connected to are lit. For more information, click here. Access the router’s web-based setup page. Open any web browser such as Internet Explorer®, Mozilla Firefox® or Safari®. Enter “192.168.1.1” in the address bar then press [Enter]. You will then be asked for your login details. Leave the User name field blank and enter “admin” in the Password field then click OK. NOTE: If you have received an error message after typing your router’s password, this means that the password entered is incorrect. 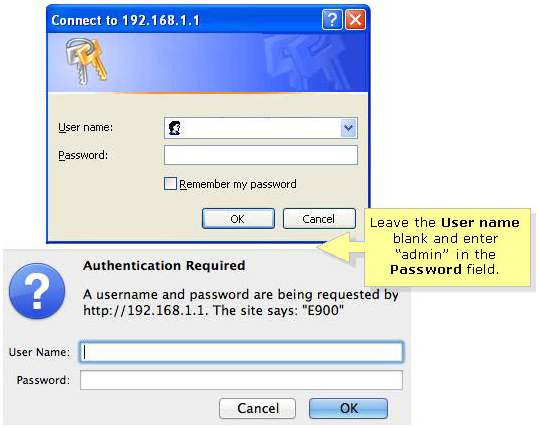 Try accessing the router’s web-based setup page again and enter the correct password. If you lost or forgot your router's password, click here to know the steps on how to reset the router to factory settings. On the Setup tab, click MAC Address Clone. NOTE: A Media Access Control (MAC) Address is a unique identifier pre-assigned to the network adapter of the computer. This is used by most Cable ISPs for authentication so subscribers can establish Internet connection. Thus, for Linksys router to work with your ISP, you have to enable the MAC Address Clone feature. This will allow your ISP to recognize the router as the computer with the registered MAC Address. Select Enabled then click on Clone My PC’s MAC. Once the MAC Address Clone feature is enabled, Internet status should be active. To check the Internet Connection status, follow the steps below. NOTE: Ensure that the Internet Connection Type is set to Automatic Configuration – DHCP. Click on the Status tab. Check the Internet IP Address. If it has numbers, this means the router has been properly configured. If the Internet IP Address values are showing up 0.0.0.0, click on Release IP Address then the Renew IP Address buttons. NOTE: For Wireless-B and Wireless-G routers, click on the DHCP Release and DHCP Renew buttons. You should now be able to access the Internet. If not, powercycle the modem, the router, then the computer. IMPORTANT: Powercycling the cable modem should be done with caution. Most Cable modems are bundled with Cable TV and phone connection. Some Cable modems also have backup batteries that may prevent it from being powered OFF even if the power adapter is detached from it. Refer to your ISP for detailed instructions on powercycling the modem. While the modem is OFF, unplug the power adapter from the router and shutdown your computer. Power ON the modem and wait for its lights to go steady. Power ON the router, then wait for its lights to go steady, then turn ON the computer. Your Internet connection should now be active. If you’re still unable to go online, contact your ISP to reconfigure the modem.